Along with our commitment to engaging in cutting edge research, we are also committed to the safety of our researchers. In line with that, any person working in a research laboratory is required to take the following safety trainings to assure they are prepared to work as safely as possible. Hazardous Waste Training – This course covers handling, disposing, storing, and maintaining hazardous waste safely. This is in-person training offered by UNM Safety & Risk Services (SRS) at their facility. The training is held on the second Thursday of every month from 1:30 – 2:00 PM. It is held at SRS, 1801 Tucker St., building #233 on the UNM campus map. Basic Laboratory Safety Training – Covers the fundamentals necessary to work in a laboratory safely. Researchers paid by UNM can take this course on-line by accessing UNM’s Learning Central website and searching for “Basic Laboratory Safety”. Undergraduates, and others who can’t access Learning Central can obtain the course material by contacting CBE directly. The course consists of eight modules. 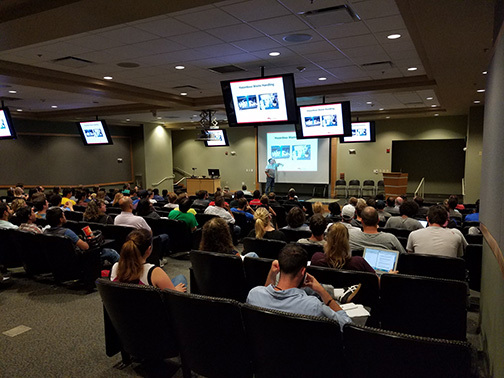 The department also conducts a mandatory safety seminar at the beginning of the fall semester that all persons working in research labs must attend. Lab Specific Training –This is training to supplement the Basic Laboratory Safety Training course. It is provided by the Principal Investigator (PI) or their designee and provides the researcher with the knowledge to safely use equipment, processes and chemicals unique to their area of study.